Check out iCopyRadio, the new technology for you to stream, record, and control your radio scanner anywhere. A reimagined scanning experience. Substantial effort was required to provide this information, and there is an ongoing cost to me to make this data freely available. If this data was useful to you, please donate to support my development of scanner tools and applications. Contact me at Justin@DigitalFrequencySearch.com with any questions, ideas, or other correspondence. Two varieties of the frequency file are available for download. The data within the first two download links is identical (different compression methods utilized), and the .csv files are around 350 MB in size. The entries do not include the emissions designator; instead, they list the power output, station class, and service type in the emissions field. There are approximately 3.1 million records in this file. 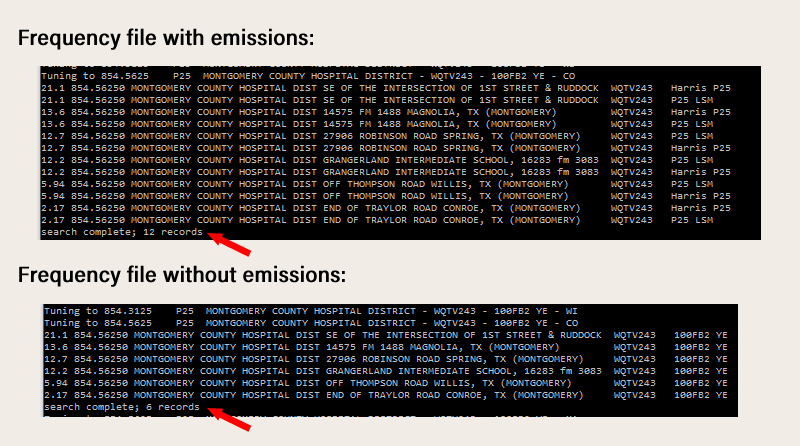 The last two files, also containing the same .csv file (different compression utilized), include a unique entry for each emission designation included on the FCC license. This .csv file is substantially larger, over a gigabyte; it contains approximately 8 million records. Some frequencies might be authorized for half a dozen or more emissions, so it is difficult to portray the emissions without being misleading unless there is a separate record for each emission. This format is also used in the search results provided on this page. If you have any ideas or suggestions, please email me at Justin@DigitalFrequencySearch.com. 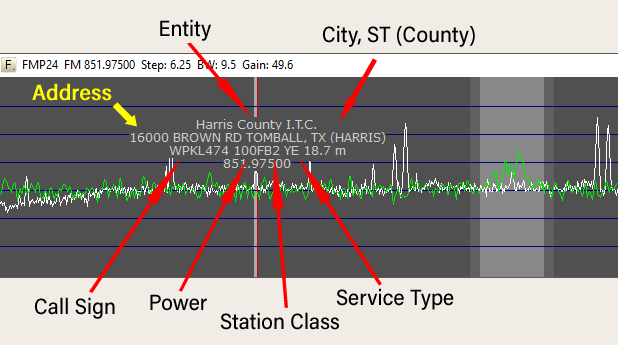 The frequency information is from the FCC Land Mobile (Private, Commercial, and Broadcast) and Market (only some records included) datasets. Only active frequencies between 50MHz and 1,000MHz are included. The database information and the CSV files for download are updated monthly on the 1st Monday of the month. Download the frequency zip file, and then extract the file. Move or copy the extracted .csv frequency file to your DSD+ directory. If you have not modified the "primary frequency list CSV path\filename" line in the FMP(24).cfg file, you should be good to go. The value in the configuration file should read ".\FMP-FreqList.csv". You can also rename the file downloaded from this website or move it to a common folder (in order to use it with multiple instances of DSD+). You would need to modify the .cfg file appropriately. The file format is slightly different than the DSD+ hosted file yet still compatible with FMP–DSD+. The changes were made to improve readability and provide as much useful information as possible. 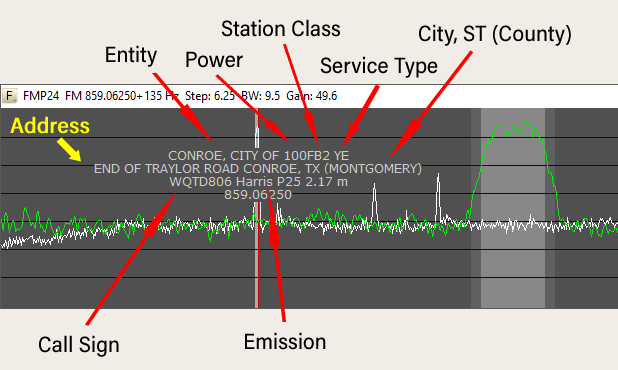 Emissions excluded: Frequency, 0, "Entity Name", "Address City, ST (County)", Lat, Long, "Call Sign", "Power Output Station Class - Radio Service"
Emissions included: Frequency, 0, "Entity Name - Power Output Station Class - Radio Service", "Address City, ST (County)", Lat, Long, "Call Sign", "Emission"
To create a personalized frequency file, begin by searching a specific county in the form below. This might be useful if you want a smaller file size or are concerned about performance. Additional instructions are present on the results page. Note: This search returns a large amount of results, especially in RF dense counties. It is possible that your browser will hang while receiving the search results. Please allow up to 1-2 minutes after clicking "Search" for the results to render. If a specific county will not display, please email me. As mentioned previously, there are two separate data formats being tested at this time. The following two graphics explain the FMP24 Spectrum Window display for each (data appears when you mouse over the spectrum). The file that includes emissions is larger in size and contains more records. For each unique location, there will be a separate listing for each emission designator assigned to the frequency. So, for example, if a 5 location simulcast site is authorized for 4 emissions, there will be at least 20 records for a single frequency. However, the tradeoff is that you have additional information about the modulation of the frequency. In addition to the frequency information displayed in the FMP Spectrum Window and the FMP Console, the DSD+ control channel activity window will display the closest frequency record. The files and results on this page were updated with the latest information from the FCC on Monday, April 15, 2019 at 5:36am CDT. Note: Due to the large file size of this data and the increased database and server load to provide the search information, this webpage is being offered on a temporary basis and all or part of the information on this page might not remain freely available. ©2017 Justin Pulliam. All Rights Reserved.